Attending an exhibition or trade show can be an expensive business and if things are not planned well unnecessary costs can be incurred. For an exhibition you are attending this year you will, no doubt, have a set budget so here are a few tips to help you make the most of your money. It is really important to choose your exhibition carefully. There is no point exhibiting at any or every exhibition, or attending ‘just because’. You need to research which events are best for your business and focus on those. Choosing the wrong exhibition will be a waste of time and money as you will not generate the results you want. Once you have decided on the exhibition, you next need to decide on what type of space you want, including its size and location. It goes without saying that usually the larger the stand space, the more expensive it is. And if you have a large stand space you need the budget to be able to fill it with exhibition equipment – it is a waste of money to have a large stand with only a couple of banner stands to use in it. Different locations in an exhibition hall also often differ in cost so choose a location and size of the stand that fits with your objectives and your budget. You can often save a lot of money by planning ahead and ordering things early. For example, by booking your exhibition stand space well in advance you will often benefit from early bird offers. The same is true for things like transport and accommodation costs. In terms of any printed display products you need, if you leave it too late to order then you might have to pay an additional express service charge to get them in time for your event. It is always worth planning ahead so you can get the best deals. If you are a regular exhibitor you will probably have lots of existing equipment which you can use. If you plan your stand well you might find that you do not need any new equipment and can work with what you’ve got. Alternatively, you might just want to add one or two new elements to refresh your exhibition stand look – perhaps a new literature holder or iPad display stand. We offer replacement graphics for all of our pop up display stands so if you already have the hardware, a cost-effective option is to just get new graphic panels printed with your new marketing message – this would be a significant saving on a whole new pop up stand. If buying new equipment, consider choosing products that can be reconfigured at a later date for a different stand size so that you can reuse what you have. 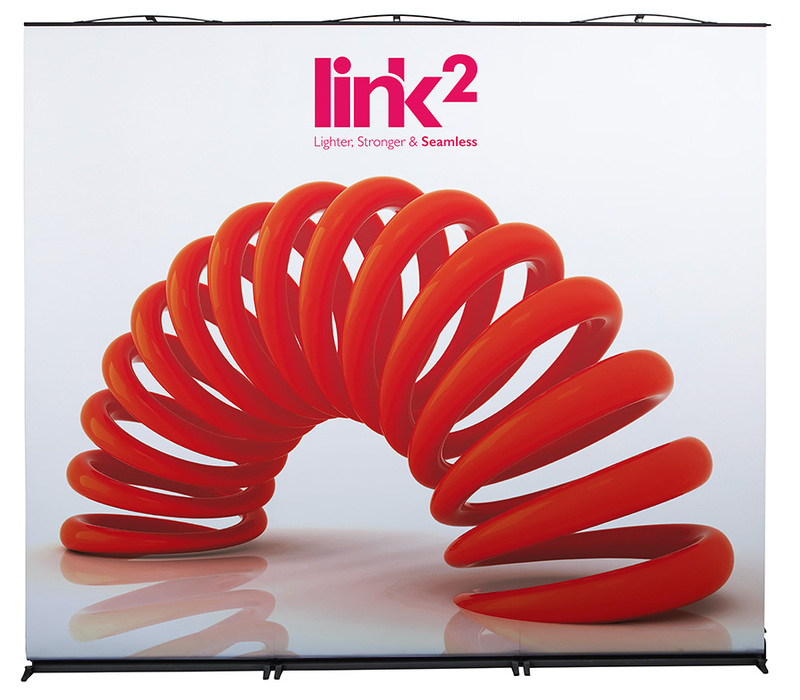 Alternatively, choose a modular display product, such as the Link2 Banner or Twist System, which can be added to in the future so the stand can grow with your business needs without having to buy a completely new stand. You have paid a lot of money for your exhibition space so you need to make sure you use the whole area wisely and to its full potential. Do not block of areas of space by poorly positioned equipment – for example, placing a pop up diagonally across the corner and wasting a whole section of space behind it. Also, do not cram the whole area with stuff – you need to get a balance so there are enough display elements but also space for visitors and staff to work. Plan where you are going to put each element within the space so that the stand works in the best way possible. You can do this by drawing a plan to scale or even by measuring out the space in your office and fitting all the elements together – a kind of trial run of your stand. You might have grand plans for all the exciting new exhibition equipment you want to buy and use. However, having everything you want will be expensive so you need to question every element of your stand – be it a pop up stand, roller banner, counter or AV equipment – ask yourself if you really need it, will it help meet your exhibition stand objectives, does it fit on the stand both practically and aesthetically? Doing this will make sure you do not waste money on display elements that will not generate return on investment. If you are outsourcing the graphic design for any elements of your stand, be aware that the more alterations and amendments you make, the more you are likely to be charged. To avoid this, make sure your design brief is clear and details exactly what you want the design to portray so that the designer understands this from the beginning and stands a better chance of getting your design right first time. Ensure you are clear from the start how much the initial fee is, what is included and how much extra amends will cost. If you are new to, or inexperienced at, exhibiting do not be afraid to ask for advice or help. Ask advice on the venue, the type of stand or equipment you need, the type of people who are attending the exhibition etc. All of our sales advisors are experts in exhibition stands and equipment and will be more than happy to discuss your requirements and advise on the best and most cost-effective solution for you. Some exhibition equipment can be very expensive so it is worth spending some time researching suppliers and looking at costs, especially if you are on a tight budget. Prices can really vary for the same product so it is worth doing this to make sure you are getting the best for your money. At XL Displays we strive to be the most competitive on the market without compromising on quality. We offer a price promise to match a like-for-like quote and back up this promise with high quality products and award winning customer service and aftersales care. For help, advice or more information on exhibition stand design or portable exhibition stand products, please contact us or call us on 01733 511030.